What would be the effects of class I antiarrhythmics on cardiac depolarization? Why? Nodal, non-nodal, or both? What would be the effects of class III antiarrhythmics on ventricular myocyte action potential? Why? Class III antiarrhythmics – main effect on EKG intervals? Why? What does this increase the risk of? What would be the effects of class IA antiarrhythmics on cardiac depolarization? Why? What would be the effects of calcium channel blockers on heart rate? Why does this make sense? Calcium channel blockers would affect which EKG interval in particular? Why? What would be the overall effect of ACh on heart rate and conduction via the AV node? Why? Note: this lesson builds on a previous lesson on ion channel physiology. We will begin by considering ventricular myocyte action potentials, then move on to consider the special case of nodal tissue. What effect would opening Na+ channels have on a cardiac cell’s membrane potential? What effect would opening Ca++ channels have on a cardiac cell’s membrane potential? What effect would opening K+ channels have on a cardiac cell’s membrane potential? 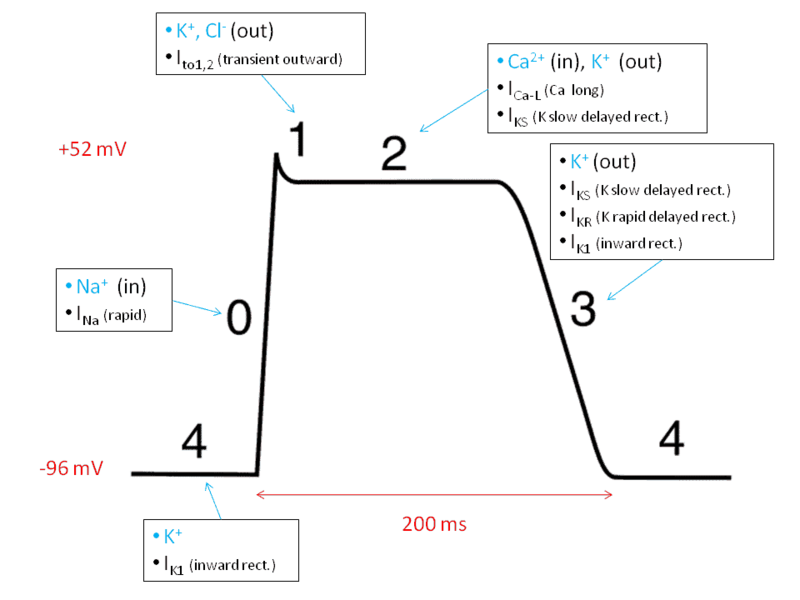 Ventricular myocyte action potential – how many phases are there? What are they? On an EKG, the P-wave corresponds to what? On an EKG, the QRS complex corresponds to what? On an EKG, the T wave corresponds to what? Phase 0 – Which ion channel(s) open/close? Effects on overall membrane potential? Phase 1 - Which ion channel(s) open/close? Effects on overall membrane potential? Phase 2 – Which ion channel(s) open/close? Effects on overall membrane potential? Phase 2 – most closely corresponds to what on EKG? Why does this make sense? Phase 3 – Which ion channel(s) open/close? Effects on overall membrane potential? Phase 3 – most closely corresponds to what on EKG? Phase 4 – Which ion channel(s) open/close? Effects on overall membrane potential? Class I antiarrhythmics – affect what ion channel(s)/receptors? IA, IB, or IC – which affects another ion channel? Which ion channel is this? Class III antiarrhythmics delay Phase 3 repolarization by blocking the K+ channels necessary for repolarization. Note that Class IA antiarrhythmics will have similar effects on Phase 3 repolarization, as they also block K+ channels. Slows repolarization, so will prolong time between QRS complex (ventricular depolarization), and T wave (ventricular repolarization). Next, we move on to discuss nodal tissue. Nodal tissue action potential – how many phases are there? What are they? Phase 0 – why is the action potential determined by Ca++ channels, and not Na+ channels? In order to activate Na+ channels generally in the heart, you must first REMOVE INACTIVATION from them (double-negative, I’m sorry). In order to remove inactivation, you must have a more negative membrane potential. This is ONLY possible in non-nodal tissue, because of the presence of the special K+ channel, called IK1. In other words, nodal tissues HAS Na+ channels (oddly enough), but it does NOT use them, because the membrane potential does NOT become negative enough to remove inactivation of the Na+ channels. Ca++ channels do not have this sort of regulation, and thus will be active in nodal tissue. What is the next phase to occur following Phase 0? Phase 4 – what will happen eventually following slow depolarization? What Phase will this correspond to? What special K+ channels are present in nodal tissue that are absent in ventricular tissue? What causes them to open, and what would be the effect? What is the normal pathway of conduction through the heart, starting with the SA node? 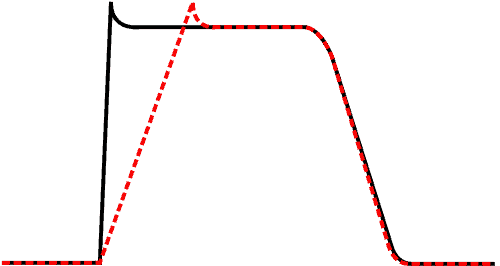 When the conduction signal moves from SA node to atrium, what causes the atrial depolarization? What structures allow for depolarization of the atrium in response to SA nodal depolarization? How? Allows for direct connection of cytoplasm between adjacent cells. This allows for the direct transfer of ions (and thus the wave of depolarization) from one cell to the next. What allows for depolarization of the AV node? What does normal sinus rhythm mean? What determines the heart rate assuming a normal sinus rhythm (i.e. the rhythm originates in the SA node)? What determines the speed of conduction through the AV node? Why does it make sense that it is phase 0 and NOT phase 4 depolarization that will determine this? In contrast, the AV node is depolarized directly following atrial depolarization. Note that this is NOT spontaneous, and is in fact triggered by the atrial depolarization itself. Class II antiarrhythmics – affect what ion channel(s)/receptors? Class IV antiarrhythmics – affect what ion channel(s)/receptors? Almost there! Think about how nice it will be to finally understand the antiarrhythmics section in First Aid!! Photos by: ZaaFari,Silvia3, and Kalumet.